Surprisingly diverse for such a narrow strip of land pressed against the Mediterranean, modern Israel only dates back to 1948, though the history of this "Holy Land" spans many millennia. The big three monotheistic religions--Christianity, Judaism, and Islam--maintain extremely strong ties to this part of the world, so you can expect to see plenty of historic churches, mosques, and synagogues during your holiday in Israel. Beyond its undeniable cultural appeal, Israel also offers impressive natural features, including the Dead Sea and Makhtesh Ramon, one of the world's biggest craters. As you tour Israel, you'll find yourself following in the footsteps of figures that helped shape the world thousands of years ago. Jerusalem District: Featuring top Israel attractions brimming with deep historical and religious significance, an emotionally moving trip to Jerusalem District will linger in your memory forever. Galilee: Ranking among top destinations for tourism in Israel, this mountainous region invites you to explore its biblical sites, scenic trails, crusader castles, Jewish catacombs, and Druze villages. Dead Sea Region: An Israel holiday wouldn't be complete without the eclectic scenery of the world's lowest area, featuring rugged canyons, deserts, lush oases, and ruins of ancient sites. Tel Aviv District: Israel's smallest but most densely inhabited district stretches along the Mediterranean shore, offering numerous historic sites to explore at a safe distance from conflict areas. Jerusalem: One of the few places in the world with such a rich and diverse historical and cultural heritage, this holy city is the most popular destination on an Israel tour. Tel Aviv: Brimming with World Heritage-listed architectural landmarks, contemporary galleries, artisan boutiques, chic restaurants, and top beaches, the so-called "White City" will give you more than a few Israel vacation ideas. Haifa: Combining thriving waterfront and pleasant gardens with historic architecture, this picturesque port is a popular and relaxing Israel holiday destination on the Mediterranean. Tiberias: Nestled on the shores of the biblical Sea of Galilee, Tiberias draws visitors with its famous traditional mineral spas, a bustling waterfront, and a number of religious and historic sites. Arad: A city favored by asthmatics worldwide for its clean, dry air, Arad offers a fair share of Israel sightseeing, including the ancient Masada Fortress, the ruins of Tel Arad, and waterfront views of the Dead Sea. Eilat: Sitting on the Red Sea, this resort town draws crowds of tourists, both local and foreign, with its colorful marine park and dolphin reef. Old City of Jerusalem: The heart of the Jewish community and an integral site in Christianity and Islam, Jerusalem's ancient core boasts some of the top Israel attractions, such as the Western Wall, Church of the Holy Sepulcher, and the Dome of the Rock. Western Wall: An important landmark and a holy prayer site for modern Jews, the Western Wall hides thousands of notes written by devoted worshipers within its numerous cracks. 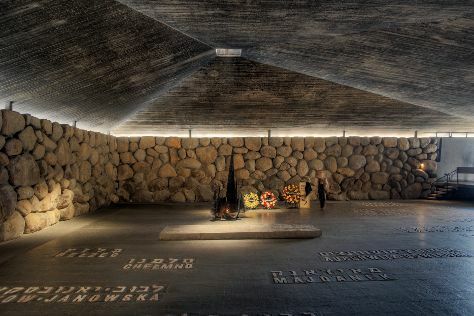 Yad Vashem - The World Holocaust Remembrance Center: Mourning millions of genocide victims, this memorial provides insight into the lives of European Jews, as well as the "righteous gentiles" who risked their lives to save them during World War II. Jaffa Old City: A walk through Old Jaffa's ancient stone arches, alleyways, and open markets will give you a taste of hybrid Jewish and Arab culture created over the centuries by the town's many rulers. Church of the Holy Sepulchre: Believed to be the site of both Jesus' crucifixion and tomb, this church ranks among the top places to visit in Israel for Christians. Israel Museum: Israel's largest cultural institution draws crowds of curious visitors with its enormous collection of artifacts, including the famous Dead Sea Scrolls. Mount of Olives: Appealing to Jewish and Christian pilgrims alike, this holy mountain serves as a cemetery for important Jews and contains many pilgrimage sites, including a teardrop-shaped Franciscan church. Masada National Park: Overlooking the Judean Desert, this World Heritage Site holds the remains of King Herod's fortress, where in 73 CE Jewish rebels endured a Roman siege before committing mass suicide. Baha'i Gardens and Golden Dome: The symmetrical and beautifully landscaped grounds of these gardens are topped with the shrine of the Bab, a Baha'i holy leader and prophet. Underwater Observatory Marine Park: Boasting a 360-degree panorama of marine wildlife and exhibits of rare species, this marine park remains a must on any nature enthusiast's Israel itinerary. Most of the places to visit in Israel possess complex historical, religious, and cultural heritage, which younger children might not fully appreciate--that said, Israel isn't just about museums and learning. The beaches of Haifa and Tel Aviv, as well as the luxurious coastal town of Eilat on the shores of the Red Sea and the Dead Sea region offer a plethora of fun activities suitable for families with children. However, a trip to Israel wouldn't be complete without exploring its history, so be sure to pay a visit to Masada and Jerusalem. If carefully planned, your family vacation in Israel can offer unforgettable experiences for kids: from riding in the Jordan Carriages and floating in the Dead Sea to exploring a biblical desert fortress and hidden tunnels. Other adventures, such as camel riding in the desert and camping out under the stars at Timna Park, await in the north of the country. Give your children a taste of communal living at one of the kibbutzim, Israel's traditional farming communities. The south of the country offers a range water activities, including snorkeling in the Red Sea, swimming with dolphins, and exploring coral reefs. Israel's complex ancient and modern history, and sensitive religious issues and politics, make some of its attractions (such as the Holocaust Memorial) unsuitable or even inaccessible for children under 10. Keep that in mind when putting together your Israel itinerary. Also, museums are usually closed on the Sabbath (Saturday), although ruins and national parks remain open. To avoid big crowds--which can make children, especially toddlers, uncomfortable--make sure your Israel vacation does not fall during busy religious holidays. Israeli cuisine combines influences from various Jewish traditions, as well as Mediterranean, Levantine, and Middle Eastern cooking. While Israelis relish a great variety of food, some dishes, such as falafel, represent staples of a typical diet. Try shakshuka, an egg dish, for breakfast, and prepare to consume copious amounts of olive oil and garlic, hummus, tahini, and baba ganoush (a tangy eggplant spread)--core ingredients and side dishes. Historical food markets, such as Mahane Yehuda Market and Shuk Ha'Carmel, feature rows of colorful, mouthwatering produce for you to sample. Those with a sweet tooth should try kanafeh, a Levantine dessert very popular in Israel: put simply, it's a cheese pastry soaked in sugary syrup. All these traditional Israeli dishes are offered in restaurants, food stands, and markets throughout the country, along with plenty of international flavors brought here by chefs trained abroad. Tel Aviv alone has over 100 sushi restaurants. A trip to Israel provides countless shopping opportunities, whether you prefer the coziness of modern shopping malls or the bustling Oriental atmosphere of traditional souks. Arguably the shopping capital of Israel, Tel Aviv boasts entire streets dedicated to selling one particular product. In Old City of Jerusalem and Jaffa Flea Market, look for genuine Israeli gifts and souvenirs, from Kabbalah jewelry and traditional Judaica gifts to Dead Sea cosmetics and leather goods. A visit to Nachlat Binyamin Pedestrian Mall or Mahane Yehuda Market will force you to brush up on your bargaining skills as you haggle for authentic jewelry, antiques, and local art from bohemian craftspeople. In the past few decades, large shopping malls have sprung up in Ramat Gan, Haifa, and Eliat. Unless you're staying in Tel Aviv, remember not to plan your shopping on Saturday, since all other cities in Israel close their shops on the Sabbath. ●	Both Hebrew and Arabic are official languages in Israel. ●	Israel has the highest percentage of college degrees, museums, and startup companies in relation to its population. ●	The lowest land below sea level (the Dead Sea region) and the lowest freshwater lake on Earth (Sea of Galilee) are both located in Israel. ●	One of the world's smallest subway systems is in Haifa, Israel. ●	Israelis take Jewish law so seriously that even their McDonald's food and the glue on their stamps are kosher. ●	With the world's highest concentration of hi-tech companies, Israel is the birthplace of cell phones, voicemail technology, and antivirus computer software. When visiting religious sites, don't wear clothing that exposes your legs, arms, or shoulders, and try to restrain yourself from public displays of affection. Don't smoke around religious people on Saturday. If invited for a drink or dinner, don't offer to pay. Likewise, if it was you who made the invitation, don't expect your company to pay. Don't wander around the Gaza strip or the Golan Heights without a guide. Israeli people observe a number of public, religious, and school holidays throughout the year. Jews celebrate the New Year, unlike the rest of the Western world, in September. The period between the beginning of September and the end of October is packed with the majority of official holidays, when almost all business in Israel shuts down. All Jewish traditional festivals, observed both in Israel and by Jews in the diaspora, originated in antiquity and are deeply rooted in Judaism. Major religious holidays such as Rosh Hashanah, which marks the beginning of the Jewish New Year, Yom Kippur, Chanukah, Purim, and Passover represent great opportunities to observe traditional rituals and customs. A few common phrases in Hebrew--such as "shalom" (used equally as hello and goodbye), and "toda raba" (thank you very much)--will help you in interacting with the locals. To wish a happy birthday or congratulate someone on bar mitzvah, an engagement, or a new job, a simple "mazel tov" (good luck) will do the trick. If someone greets you with "Shalom Aleichem," a proper response would be "Aleichem Shalom." Located in a subtropical region, Israel enjoys a Mediterranean climate in the north and an arid climate in its southern and eastern territories. Its coastal regions boast hot summers and rainy winters. The ideal time for an Israel vacation is during its short spring (February and March), when moderate temperatures hover around 15-25 C (60-70 F). Vegetation blooms after winter rains, and the sweltering summer is still months away. If you do visit in summer, plan a trip to Tel Aviv to take advantage of the perfect beach weather. Avoid hiking in the heat, which peaks in July and August, except in the north of the country. You'll also need to dial back your activity during spells of "hamsin" (hot, dry wind) at the beginning and end of summer. Uncomfortably high temperatures in the resort town of Eilat sometimes exceed 43 C (110 F). Also brief, autumn is similar to spring when it comes to temperatures, but the rainy season starts in October and continues throughout the winter, periodically interrupted by short sunny periods. Thanks to the country's compact size and well-maintained roads, touring Israel by car is easy. Public transportation, including buses and trains, will also get you to almost any destination in a relatively short time. Across Israel, inner-city transport usually includes buses, "sheruts" (shared taxis or shuttles), and bikes, with Tel Aviv boasting the most developed network of cycling paths. Domestic flights service airports in Tel Aviv, Eilat, and Haifa. As in many places in the West, tipping is optional but expected in Israel. Leaving a few extra shekels to a bartender is considered appropriate, while waiters, bellhops, porters, and delivery people expect anything in the range of 10 to 15 percent, depending on the quality of the service. Taxi drivers, on the other hand, will usually give you back the change even if you don't ask for it.